"1. Make it incredibly user-friendly. Don't bombard people with information - make every page reachable from the home page so they can easily access information IF they need it, but don't smash them with it all at once. 2. Stating the obvious but being optimised for mobile is an absolute must-have. Not even mobile-friendly, it should be mobile FIRST. Make sure it presents correctly, loads quickly on mobile and works on every device. 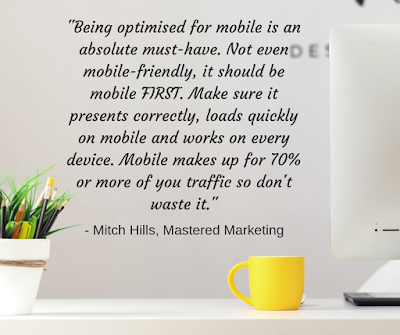 Mobile makes up for 70% or more of you traffic so don't waste it. 3. Make it look modern and clean. If it looks outdated or clumsy it will leave a bad impression. 9 times out of 10 a clean, 'less is more' approach is the way to go, using realistic, powerful imagery (that doesn't look like a cheesy stock photo). You can use Unsplash for great (and free) royalty free photos. 4. Make it SEO friendly. If you're not an SEO guru don't worry, just make sure each page has a title and description, minimise the images so it loads quickly, make sure you've submitted a sitemap to Google Search Console and you delete any pages you aren't using. 5. Create some blog content and send people to your website. Like I said, no need to be an SEO wizard but ultimately you want to send people to your site whenever you can. Mastered Marketing helps people help more businesses. A Brisbane-based digital agency passionate about small businesses, we help businesses explode their brand & get more customers online with world-class digital marketing. Connect on Instagram or Facebook.